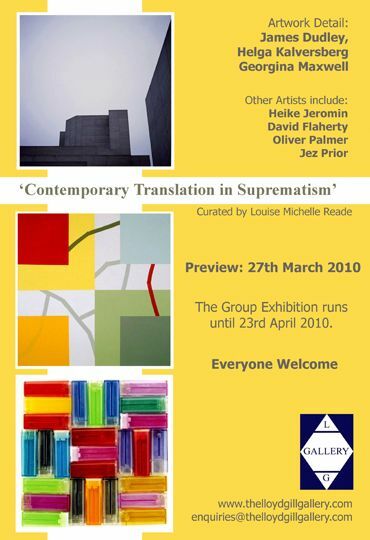 âContemporary translation in Suprematism' by curator Louise Michelle Reade Preview 27th March Starts at 7pm  10pm ALL WELCOME, free complimentary glass of wine. Exhibition runs till 23rd April. Open Tuesday  Saturday 10am  4.30pm The artists in this exhibition are showing work that solidifies a deep notion of the âSuprematism' movement through various renditions in Paint, Scupture, Photography and Mixed media.